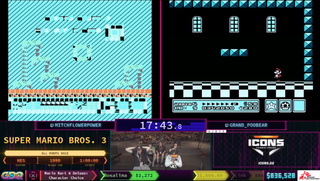 Last night, the top two Super Mario Bros 3 speedrunners faced off for a race that ran into problems—including game crashes. Despite the hurdles, speedrunners Mitchflowerpower and GrandPOObear bounced back and showed sportsmanship and skill under stress. In their “All Forts” run at Summer Games Done Quick 2018, the pair sped through the game and stopped to tackle all of the game’s fortresses and the bosses as planned. The runners, who sit at the top of the game’s leaderboards and started out in a close race, hit trouble about twenty minutes in. Reacting to a close call hit from an enemy, GrandPOObear appears to have accidentally hit his opponent’s NES. Mitchflowerpower’s game glitched, forcing him to restart. In a wonderful display of sportsmanship, GrandPOObear stopped his run and waited until Mitchflowerpower could catch up. 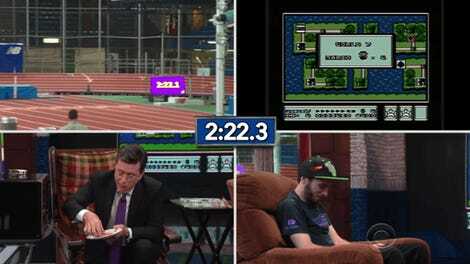 The slowed runner used hidden warps to skip levels, and once the runners resumed their race, they took time to plan out a new route through the game that would ensure both of them had access to the same items. Mitchflowerpower was patient and took the setback in stride, leaping back into the race with enthusiasm. Tragedy struck again near the end of the run as Mitchflowerpower’s NES once again glitched, causing his game to freeze a second time. GrandPOObear finished his run as Mitchflowerpower once again raced through the game and finished by showing off a precise glitch that allowed him to warp directly into the credits. In spite of the troubles and regrets — and in part because of all that nail-biting drama — the race was an absolute blast to watch. The runners showed off their charisma and care for the integrity of the match, as well as their their impressive platforming skills. It might not have ended as they wanted, but it resulted in one of the most unforgettable runs of SGDQ.